Towards the end of the war the German Waffenprufamt 6 (WaPruAmt 6) headed by General H.E. Kniepkamp desperately tried to simplify their logistics by reducing the number of different types of tanks in service. These efforts crystallized in the E-series of tanks, in which the 25-ton vehicle was the E-25 Jagdpanzer, meant as a replacement for the Stug III, Stug IV and Japgdpanzer IV. It was a squat (in the eyes of some even ugly) vehicle. As far as I know it never left the drawing board, which gives us some margin for artistic licence. The model comes in a sturdy, top opening cardboard box. I believe the parts lay-out above speaks for itself. The hull is a single block, without notable imperfections and apart from the running gear there are very few parts. The tracks are resin L&L. There is almost no assembly needed for the hull apart from the small turret, gun mantlet and the hatches. Something resembling an "ejector mark" or "sink mark" was found just behind the sliding persicope cover, which didn't look right to me, so I covered it with a circular plate. This might (in my imagination) have been a cover for the Nahverteidigungswaffe that was not fitted to this particular vehicle. Some kits (of other brands and in other scales) of this vehicle show the ventilator in this location, which in this kit is placed further backwards. Some kits also show different styles of hatches and exhaust. There is some discussion about the utility to have the rangefinders fitted on the sides of the hull, as they are supposed to point in the same direction as the main gun (as when fitted on the turret of a tank), but they look cool nevertheless. I removed the right front mudguard to simulate battle damage and added wiring for the left headlight. New tow hooks were made from plasticard. The hinges of the hatches were improved with some bits and pieces of plastic. In my specimen the main gun barrel was deficient, so I made one from brass tubing. Don't ask me what the "sleeve" half-way the barrel is supposed to represent. It just looked cool. 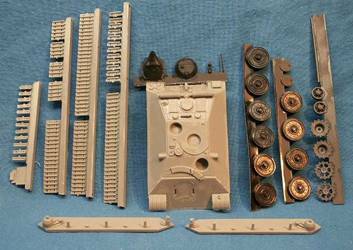 If you don't want to make your own barrel, a turned metal barrel for the Jagdpanzer IV L/70 or Panther Ausf. F will do perfectly. The secondary barrel (for the small turret on top of the hull) was ok, but I replaced it with a 20mm Flak-barrel I had lying around (I believe it was from Milicast) because it was somewhat better detailed. The big roadwheels were sanded down, as they were rather thick and of uneven thickness and axles made from plastic tubing. The whole was assembled on a rig, using the kit part for the sides of the hull and then attached to the hull. The detail on the tracks was rather soft, and gluing resin L&L tracks together didn't seem too much fun. Fortunately, Andy Smith sent me Dragon DS tracks for the Panther which, remarkably, fitted perfectly ! 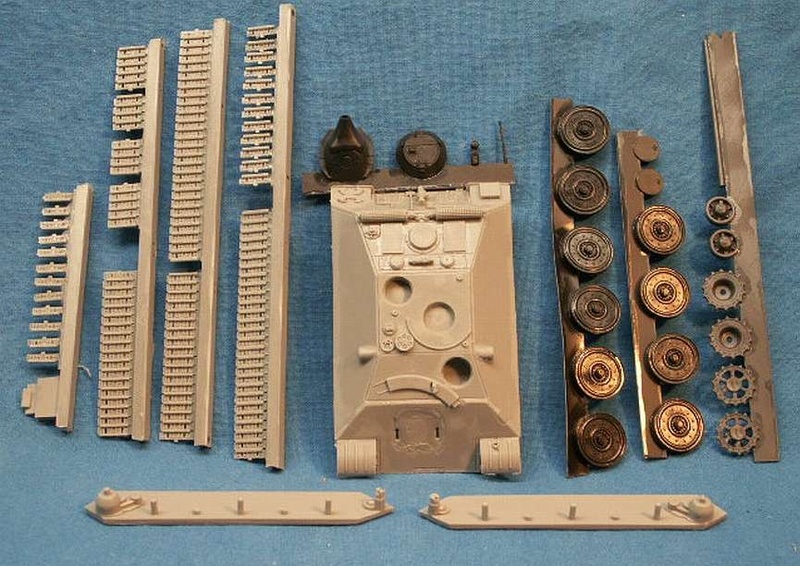 This is not surprising as both tracks were indeed very similar, but the E-25 tracks had a single central row of track teeth, while the Panther had two rows. I still believe they are a good match. No marking options or decals are provided. Then again, the vehicle was never built, so let your imagination run wild. I went for a vehicle captured and used by Russian troops. The flag is from Unicorn (set 72.878) and is a decal applied to a piece of thin foil (that comes with the decals). After installing the vehicle in the diorama, dust was applied by airbrush and with pastel chalks. 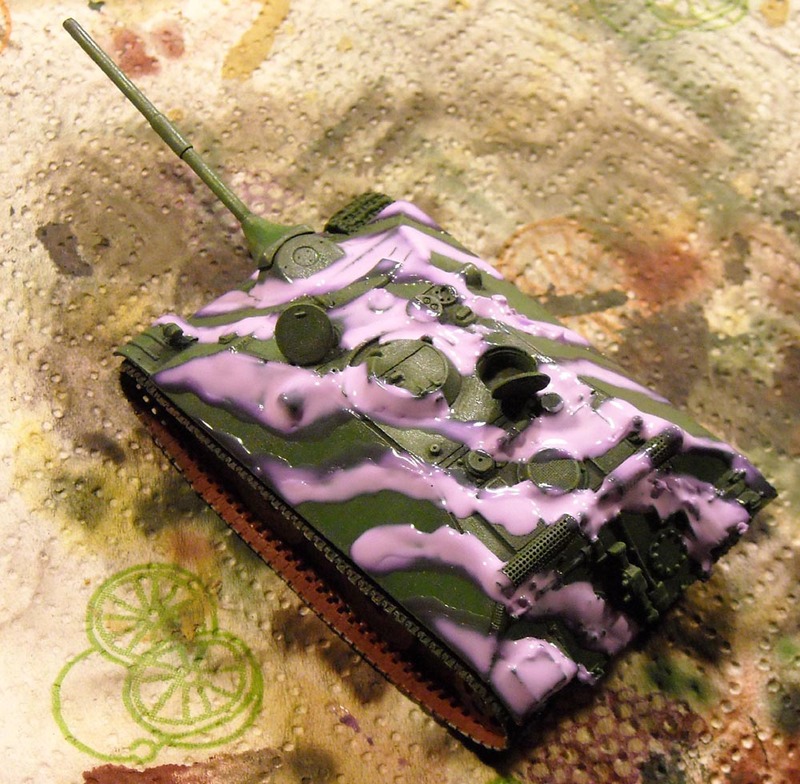 While it looks realistic to me, it's a pity that it destroyed the weathering and highlighting effects to a large extent. Figures were assembled from various Preiser sets (72525 and 72526) and the Mausturm is a Dragon item that came as a gift from Tony Ivey.